The Trabants with noted Delaware historian John Munroe. Photo by Eric R. Crossan. 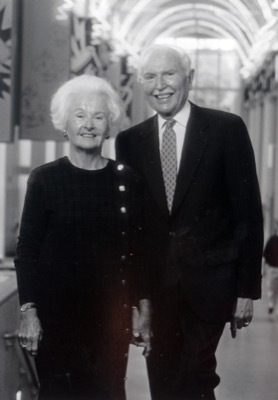 4:03 p.m., May 6, 2016--Jeraldine “Jerry” Merlyn Shanessy Trabant, the widow of University of Delaware President Emeritus E. Arthur Trabant, died May 2. She was 92. The Trabants came to Delaware in 1968 when Dr. Trabant became the University’s 22nd president. 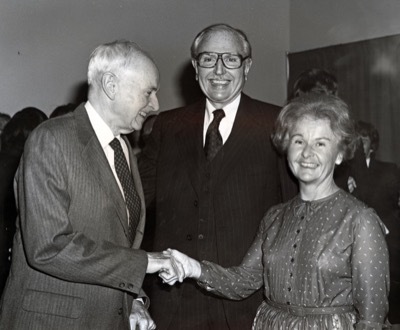 His tenure as president -- from 1968-87 and from 1988-90 -- was one of the longest presidencies of a major university in modern times, and Mrs. Trabant worked tirelessly alongside him throughout that time for the betterment of the University, its students and all stakeholders of the institution. In May 1980, she received a master of science degree from UD and began a career in marriage and family counseling at the Newark Family Counseling Center, which she enjoyed until retirement. "As an alumna of the institution and as an informal and admired ambassador for the University, Mrs. Trabant improved our campus through her advocacy and support of our students and our programs,” Acting President Nancy Targett said. "Her efforts, many of which were behind the scenes, helped move the University of Delaware forward from the late 1960s through the '70s and '80s. Her role in the local community, both professionally as a family counselor and as a volunteer for numerous organizations, continued long after she left the President’s House. Jerry Trabant will be missed." When the Trabant University Center was named in President Trabant’s honor in 1996, Andrew B. Kirkpatrick Jr., then chairman of the University’s Board of Trustees, remarked, “Together, Art and Jerry and their synergy have provided the University of Delaware and the state of Delaware with a unique legacy of integrity, compassion and understanding that will be memorialized for all time by this signature building we dedicate today." Jerry Trabant was born in Indianapolis, Indiana, in 1923. She attended Shortridge High School in Indianapolis and graduated from Huntington Park High School in California. She had already met and was dating her future husband when she went on to Occidental College. Her marriage to Dr. Trabant followed in 1943, and she graduated from the University of Southern California with a major in history. In 1946 the Trabants moved to West Lafayette, Indiana, where he was a math instructor at Purdue. She was a Girl Scout and Brownie leader for her two daughters. Active in the local League of Women Voters, where she served as president, she also was president of the Purdue Women's Club. The family moved to Buffalo, New York, in 1960, when Dr. Trabant became the dean of engineering at the University of Buffalo. She was active with local charities and a tireless and innovating fund raiser for the Buffalo Philharmonic, entered a master's program at Buffalo and went on to teach high school English from 1965-66. In 1966 they went to The Georgia Institute of Technology and then to the University of Delaware in 1968. 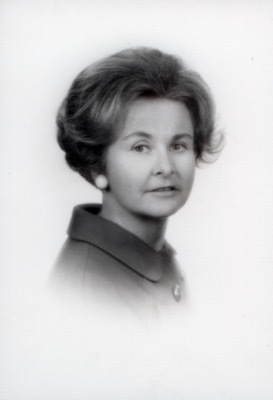 In Delaware, Mrs. Trabant was active in organizations ranging from League of Women Voters, the Girl Scouts, Planned Parenthood, the Battered Women's Center of Delaware and the New Castle County YWCA. President Trabant died in July 2012, and their middle daughter, Arta Trabant, passed away in December 2015. Mrs. Trabant is survived by two daughters, Jeri Trabant and husband, Keith A. Wallace, and Amanda Trabant and husband, Enrique Alcor. A celebration of her life will be held from 5:30-7 p.m., Friday, May 6, at Chandler Funeral Home, 7230 Lancaster Pike, Hockessin, DE 19707. In lieu of flowers, the family suggests donations to the Nellie Thompson Rudd Women's Studies Award at the University of Delaware. Please send contributions to: University of Delaware, Gifts Processing, 83 East Main St., 3rd Fl., Newark, DE 19716. Make checks payable to ‘University of Delaware’ and include on the memo line “in memory of Mrs. Jeraldine S. Trabant.” Gifts can also be made on the University of Delaware’s secure website, or by calling 302-831-2104.